What is Chanukah? ... When the royal Hasmonean family overpowered and was victorious over [the Greeks], they searched and found only a single cruse of pure oil... enough to light the menorah for a single day. 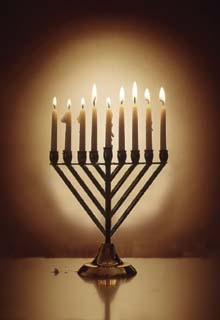 A miracle occurred, and they lit the menorah with this oil for eight days. On the following year, they established these [eight days] as days of festivity and praise and thanksgiving to G‑d. Many miracles, great and small, accompanied the liberation of Israel from Hellenic dominance and the reclaiming of the Holy Temple as the lighthouse of G‑d. But there is one particular miracle, the Talmud is saying, that is the sum and substance of Chanukah: the miracle of the small cruse of pure oil that burned for eight days. The challenge faced by the Jewish people at that time was unlike any that had confronted them before. Hellenism, a noxious blend of hedonism and philosophy, could not be resisted by the conventional tools of Jewish learning and tradition. Only the cruse of pure oil-the supra-rational, supra-egotistical essence of the Jewish soul, from which stems the Jews intrinsic self-sacrificial loyalty to G‑d could illuminate the way out of the mudswamps of Hella. Only by evoking this inner reserve of incontaminable oil were we able to banish the pagan invader from G‑d's home and rekindle the torch of Israel as a light unto the nations. But this was oil sufficient for only a single day. By nature, man's highest powers flare brightly and fleetingly, soon receding to the supra-conscious, supra-behavioral place from which they have come. When a person's deepest self is challenged, the essential oil of his soul is stimulated, and no force on earth can still its flame; but then the moment passes, the cataclysmic levels off into the routine, and the person is left with his ordinary, mortal self. The miracle of Chanukah was that they lit the menorah with this oil for eight days—that the flame of selfless sacrifice blazed beyond a moment of truth, beyond a day of reckoning. That the small pure cruse of oil burned beyond its one-day lifespan for an additional week, illuminating the seven chambers of the soul (Kabbalistic teaching enumerates seven middot or basic character traits—love, restraint, harmony, ambition, devotion, bonding and receptiveness—from which stem all feelings and motivations of the heart). This was no mere flash of light in a sea of darkness, but a flame destined to shed purity and light for all generations, under all conditions. Thus the Talmud relates that it was only on the following year that these eight days were established as the festival of Chanukah. A year is a microcosm of time, embodying all of times seasons and transmutations. So it was only on the following year, after it had weathered all fluctuations of the annual cycle, that the victory of Chanukah could be installed as a permanent fixture in our lives. Why Don’t Miracles Happen Anymore? Why Is Chanukah Eight Days Long? Why the Discrepancy in the Chanukah Prayer? There is a view that the miracle of the oil happened only because the Jews did not realize the victory in the war was a miracle. The oil miracle showed them that something special was going on. 1) The oil was taken from olives that grew in a certain city, Tekoa, which was a four day distance from Jerusalem. Until they travelled there, prepared oil, and returned, it was eight days later. Why was the oil so difficult to come by when there are olive groves all around? Chanukah in an Christian home I believe that Christians have lots to learn from our Jewish heritage. We as a Christian family tries to obey the Jewish feasts to celebrate our common ground namely G-d.